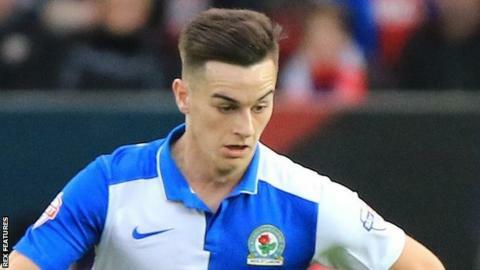 Cardiff City manager Russell Slade has urged Tom Lawrence to seize his chance for club and country after his "hijack" of the Wales striker. Loanees Lawrence and Kenneth Zohore are both in contention for their debuts in Saturday's Championship clash with visitors MK Dons. With Lawrence looking to secure his spot in Wales' squad for Euro 2016, Slade believes his arrival is ideal. "I think he is a very good fit in every sense," said Slade. Former Manchester United striker Lawrence, 22, was a deadline day recruit from Premier League leaders Leicester City. Cardiff acted when Lawrence's loan at Championship rivals Blackburn came to an end. "Obviously Blackburn were keen to keep him so I did a little bit of work to try and hijack him out of there and it came off," said Slade. "I was pleased he wanted to join us and it would have been easy for him in many ways to have stayed at the club he was at. But we are delighted it has worked out. "He is at the stage of his career where he's still learning. I am pretty sure he will be full of enthusiasm and willing to learn because I am pretty sure he will want to be a part of the Euros as well. "It is a busy period for him and an important period for him. That is why I say it could be a very good fit and if he does well for us, we will be delighted to see him play for Wales in the summer." Twice-capped Lawrence has scored eight goals in 64 senior appearances. Slade is surprised by his modest return but believes Cardiff's method will help him. "He is clever, his feet are good, his movement is good," he added. "I think in our side he will score more goals. He's very bright." Meanwhile Slade confirmed there had been no talks with the club about extending his own contract which comes to an end this season. "We will talk about that when we are ready. There is no problem with that at all," Slade said. "We have games coming up thick and fast again I am quite happy if we sit down at the end of the season take stock and see where we are. That is fine."